It may seem obvious, but if you want to be a successful waterfowl hunter, you have to get out where the birds are and not just hope you’ll get lucky and they’ll come to you. And the best method of getting up close and personal with the birds is to use one of the many excellent portable layout blinds on the market today. The best layout blinds allow a hunter to virtually disappear in the places where geese and ducks feed and rest, most often used in dry, open fields. But they can be used to great effect almost anywhere, even in flooded areas when equipped with a waterproof ground-liner. *Our Scores for the Top Layout Blinds is a composite score created by compiling review data from multiple sources and forums, along with some input from our own experience. Lightweight and Portable– Today’s blinds are constructed of tough, durable modern materials that allow them to be very light and easy to carry, and they’re easily set up in a couple of minutes. Versatile– There are a lot of different makes and models of layout blinds available today, with designs and accessories to allow for use in many situations. Concealment– Besides being available in camouflage patterns to match any environment, most blinds come equipped with ‘stubble straps’ that allow you to enhance your concealment with some brush, dry grass, cornstalks, or cattails. As mentioned, there are many layout blinds available today, at a wide range of prices. As usual, you tend to get what you pay for, although you can get into an acceptable blind relatively cheaply. Here are some quick layout blind reviews for models that are proving to be quite popular with waterfowl hunters. The AT-X Invisilay uses an innovative design that combines the characteristics of a boat with a layout blind, allowing it to be used on dry land or shallow water. It features three sets of fold-up legs that can be adjusted for height independently from 10 to 16 inches, making it useful for rough and uneven terrain. The legs are equipped with wide foot pads to keep it from sinking into wet ground. It quickly folds up into a backpack for easy portability and also features padded shoulder straps for comfort. This is one of the most versatile layout blinds available. Delta bills this blind as the most comfortable one on the market, and with its padded ‘zero-gravity’ chair and headrest it just might be. Whether that will make it more likely you’ll fall asleep in the field is another matter. This type of blind not only covers your body profile, it spreads out on the ground around you to help improve your concealment, and also gives you a place out of the weather to store equipment. The Zero Gravity just folds out into place upon arrival at your hunting spot, with no assembly to fiddle with, though it does include threaded stakes to secure it in frozen ground. It folds back up into an easy carry backpack with a couple of storage pockets to use too. Includes stubble straps for brush, but this blind doesn’t have a floor in it, which makes it easier to clean but not so good on the wet ground. This is a larger version of the company’s popular Landing Zone layout blind, intended for the big and tall and duck hunter or just someone who wants more room to move around. The Deadzone has an insulated floor which is much appreciated on cold ground. The additional material also makes the floor a bit tougher and more durable. The mesh viewing ports are pretty big on this blind which makes for better visibility, and it also has vertically-aligned flagging ports. There are plenty of stubble straps, more than on most blinds, and there’s a zipper at the foot of the blind to allow for easy cleanout, which is nice. The Tanglefree Deadzone uses a light aluminum frame and padded straps and weighs in at 19 lbs. The camo pattern pictured is the extremely popular Realtree Max5. For the larger duck hunter, the extra room in this layout blind can make a big difference in comfort and ease of shooting. This is a moderately priced layout blind from a well-known outdoors supplier. The Elite is a standard design that will nevertheless get the job done. It has a durable polyester shell, sturdy folding chair, and a zip-up cover with mesh windows that should serve well for many seasons if not abused. This blind does have floor in it so it can be used on muddy ground, and it is equipped with stubble straps. Like most modern layout blinds, it folds up into a backpack for easy transport. Big and tall hunters might want to try it out for fit before buying. If you’re on a budget the Herter’s Elite is one of the best layout blinds for the money. This is another reasonably priced layout blind that has some nice features. The Mobile 1 is a floored cocoon type blind with a padded folding layback chair. Its design allows it to be set up in just three fold-outs and packed up the same way. I really like the large mesh observation ports Mobile 1. That allows you to cover up completely for better concealment yet still see the birds. Flagging is also made possible thanks to the flagging port. Has an aluminum frame with padded shoulder straps for easy-carry. Not all layout blinds are created equal. It pays to invest a little more in a blind that has more features, and any blind you choose should have a few fundamental features and characteristics. Here are some points to keep in mind. Camo to Match Your Location: With so many patterns available today, this shouldn’t be a problem, but you’ll notice that some blinds are only offered in one or two. Shop around until you find one you like that also blends in with the areas you plan to hunt, and buy more than one if you need to. 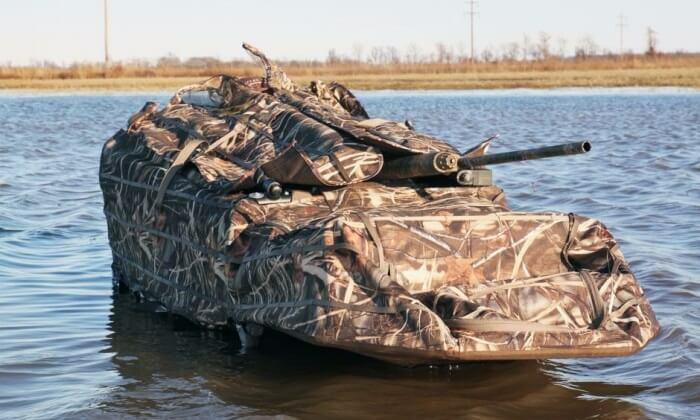 Waterproof: Seeing as you’re hunting for waterfowl, you would think this would be standard on all blinds. Unfortunately, that’s not the case. Even if you don’t plan on hunting much on wet ground, you’ll be glad for waterproofing when the rain begins. You can, of course, waterproof one yourself, but it’s easier just to buy one that is already protected. Stubble Straps: Sure, you’re already camouflaged, but covering your blind with the dry grass, brush, corn stalks, rice stalks, and whatever other flora inhabits your immediate hunting area makes concealment so much more effective. You could just lay these things on top and around your blind, but any wind at all and they’ll be gone. Stubble straps make it a lot easier. Make sure the blind you buy has them, and make use of them. Snow Covers: A snow cover allows you to turn your blind white so it blends in with the snow. This gives you a lot more versatility from your blind, and you’ll be ready if you get hit with an unexpected snow storm in the field. Some layout blinds include this as an accessory, but you may have to buy one separately. Seats and Padding: Being comfortable while sitting for hours in your blind is an important consideration. If you’re not comfortable, you’ll be miserable and you just won’t sit still. Look for seats that are ergonomically designed, while taking your own personal size and sitting preference into consideration, and make sure the seat is constructed with ample padding. Having to carry pillows and such into the field is a hassle. Door Size: When you open the door to line up a shot on a bird, you don’t want to be getting hung up in the opening. Make sure the door opens easily and quietly and allows you plenty of room to get into position quickly. A larger door also facilitates getting into and out of your blind. Openings for Flagging and Calling: Many layout blinds will have small ports to allow for flagging while completely enclosed in the blind, and most will have mesh windows for viewing and calling. If you utilize flagging a lot, make sure the blind you choose has a sufficient number of ports in the right places and that they’re large enough to use easily. Layout blinds aren’t difficult to use, but there are a few things to remember if you’re just getting started with one. A little practice and preparation go a long ways towards a successful hunt. You wouldn’t take a gun out in the field without shooting it or sighting it in, and you shouldn’t take your blind out without trying it and getting it ready at home. Practice setting it up and taking it down, and carry it around on your back for a while. It’s not a bad idea to let it sit out in the backyard for a few days. This lets the material break in a bit, and dulls the sometimes shiny surface of the blind caused by waterproofing and other factory treatments. Don’t be afraid to slop some mud and dirt on it to make it look nice and earthy, it’s made to take it. If you know the area you’re going to be hunting in, you can go ahead and start brushing in your layout blind, filling out the stubble straps with brush. You should also climb into your layout stand and get used to how it feels, while making any adjustments for comfort and utility. It’s important to practice opening the door and getting into position to shoot. Do this as many times as it takes for you to get comfortable with it, it’s not something you want to be learning while you’re out in the field. Modern layout blinds can be used in almost any type of environment where waterfowl are found. Here are some of the best places to set up your blind for success.